Adapted (slightly) from As a Man Thinketh by James Allen. SpiritSite.com adaptation is copyright © by SpiritSite.com. No part of this excerpt may be reproduced or reprinted without permission in writing from the publisher. HTML and web pages copyright © by SpiritSite.com. Please note: the "Buy the Book" link links to the original text, not the SpiritSite.com adaptation. The aphorism, "As a man thinketh in his heart so is he," (Proverbs 23:7) not only describes a man's inner character, but is so comprehensive as to reach out to every condition and circumstance of his life. A man is literally what he thinks, his character being the complete sum of all his thoughts. As the plant springs from the seed, and could not be without it, so every act of man springs from the hidden seeds of thought, and could not have appeared without them. This applies equally to those acts which are called "spontaneous" as to those which are deliberately executed. Actions are the blossoms of thought, and both joy and suffering are their fruits; thus does a man gather the sweet and bitter fruitage of his own choices. Man grows according to high laws; he is not a creation of chance. Cause and effect are as stable in the hidden realm of thought as in the world of visible and material things. A noble and God-like character is not a thing of favor or chance, but is the natural result of continued effort in right thinking, the effect of long-cherished association with God-like thoughts. A low and bestial character, by the same process, is the result of the continued harboring of groveling thoughts. A man's life is made or unmade by his thinking. In the armory of thought he forges the weapons by which he destroys himself. He also fashions the tools with which he can build heavenly mansions of joy and strength and peace. By the right choice and true application of thought, man ascends to the divine perfection. By the abuse and wrong application of thought he descends below the level of the beast. Between these two extremes are all the grades of character, and man is their chooser and master. Of all the beautiful truths pertaining to the soul which have been restored and brought to light in this age, none is more gladdening or fruitful of divine promise and confidence than this: man is the master of thought, the molder of character, and the maker and shaper of condition, environment, and destiny. As a being of power, intelligence, and love, and the lord of his own thoughts, man holds a key to every situation, and contains within himself that transforming and regenerative agency by which he may bring himself to peace. Man is always the master, even in his weakest and most abandoned state. But in his weakness and degradation he is foolish master who misgoverns his house. When he begins to reflect upon his condition and search diligently for the law upon which his being is established, he then becomes the wise master, directing his energies with intelligence and fashioning his thoughts to inspired aims. Such is the conscious master, and man can only become this by discovering within himself the laws of thought. This discovery is simply a matter of application, self-discovery and experience. Only by much searching and mining are gold and diamonds obtained, and man can find every truth connected with his being if he will dig deep into the mine of his soul. That he is the maker of his character, the molder of his life, and the builder of his destiny, he may unerringly prove, if he will watch, control, and alter his thoughts, tracing their effects upon himself and his life and circumstances. And using his every experience – even the most trivial, everyday occurrence – as a means of obtaining knowledge, he will at last find understanding, wisdom, power. And he will see the working of the absolute law that "He that seeks shall find; and to him that knocks it shall be opened." (Matthew 7:8) For only by patience, practice, and ceaseless effort can a man enter the door of the temple of knowledge. A man's mind may be likened to a garden, which may be intelligently cultivated or allowed to run wild; but whether cultivated or neglected, it must, and will bring forth life. If no useful seeds are put into it, then an abundance of useless weed-seeds will fall in, and will continue to produce their kind. Just as a gardener cultivates his plot – keeping it free from weeds, and growing the flowers and fruits which he requires – so may a man tend the garden of his mind, weeding out all useless and impure thoughts, and cultivating the flowers and fruits of useful and pure thoughts. By pursuing this process, a man sooner or later discovers that he is the master gardener of his soul, the director of his life. He also reveals his flaws of thought, and understands, with ever-increasing accuracy, how thoughts operate in the shaping of character, circumstances, and destiny. Thought and character are one, and as a man's character will always influence outer circumstance, so will the outer conditions of a person's life always be found to be related to his inner state. This does not mean that a man's circumstances at any given time are an indication of his entire character, but those circumstances are so intimately connected with some vital thought-element within himself that, for the time being, they are essential to his development. Every man is where he is by the law of his being; the thoughts which he has built into his character have brought him there, and in the arrangement of his life there is no element of chance. All is the result of a law which cannot err. This is just as true of those who feel "out of harmony" with their surroundings as of those who are contented with them. Man is tossed about by circumstances so long as he believes himself to be the creature of outside conditions, but when he realizes that he is a creative power, and that he may command the inner soil and seeds of his being out of which outer circumstances grow; he then becomes the rightful master of himself. Every man who has for any length of time practiced self-control and self-purification knows that circumstances grow out of thought, for he will have noticed that the alteration in his circumstances has been in exact ratio with his altered mental condition. So true is this that when a man earnestly applies himself to correct the problems in his thought, and makes swift and marked progress, he passes rapidly through formerly difficult problems. The mind attracts that which it secretly harbors: that which it loves, and also that which it fears. It reaches the height of its cherished aspirations and it falls to the level of its impure desires. By this process does the mind receive its own. Every thought-seed that is sown or allowed to fall into the mind and take root there, produces its own, blossoming sooner or later into act, and bearing its own fruits of opportunity and circumstance. Good thoughts bear good fruit, bad thoughts bad fruit. The outer world of circumstance shapes itself to the inner world of thought, and both pleasant and unpleasant external conditions are tools which make for the ultimate good of the individual. As the reaper of his own harvest, man learns from both suffering and bliss. 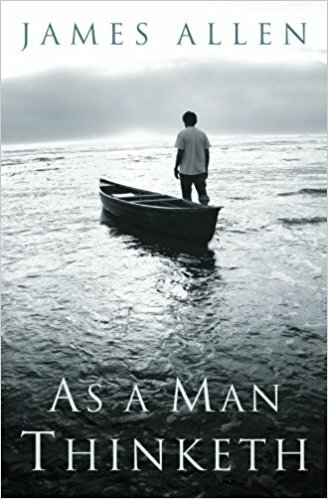 Following the inmost desires and thoughts by which he allows himself to be dominated (whether pursuing the will-o'-the wisps of impure imaginings or steadfastly walking the highway of strong and high endeavor), a man at last arrives at their fulfillment in the outer conditions of his life. A man does not come to the poor-house or the jail by the tyranny of fate or circumstance, but by the pathway of low thoughts and base desires. Nor does a pure-minded man fall suddenly into crime because of any mere external force – the criminal thought had been secretly fostered in the heart, and at last the hour of opportunity revealed itself. Circumstance does not make the man; it merely reveals his thoughts to himself. Even at birth the mind comes into its own and through every step of its earthly pilgrimage it attracts those combinations of conditions which reveal itself, which are the reflections of its own purity and impurity, its strength and weakness. Men do not necessarily attract what they want; rather, they attract what is within them. Man is chained only by himself. Thoughts are the jailers of Fate – they imprison, being base; they are also the angels of Freedom – they liberate, being noble. Not what he wished and prays for does a man get, but what he harbors within. His wishes and prayers are only gratified and answered when they harmonize with his thoughts. In the light of this truth, then, what is the meaning of "fighting against circumstances?" It means that a man is continually revolting against an outer effect, while all the time he is nourishing and preserving its cause in his heart. That cause may be a conscious vice or an unconscious weakness; but whatever it is, it stubbornly retards the efforts of it possessor, and thus calls aloud for remedy. Men are anxious to improve their circumstances, but are unwilling to improve themselves; therefore, they remain bound. The man who does not shrink from effort can never fail to accomplish the object upon which his heart is set. This is as true of earthly as of heavenly things. Even the man whose sole object is to acquire wealth must be prepared to apply great effort before he can accomplish his goal; and how much more so he who would realize a strong and well-poised life? Here is a man who is wretchedly poor. He greatly wishes that his surroundings and home comforts should be improved, yet all the time he shirks his work, and feels justified in trying to deceive his employer on the grounds that he is "poor." Such as man does not understand the simplest principles of true prosperity, and is not only totally unprepared to rise out of his wretchedness, but is actually burrowing into a still deeper wretchedness by dwelling in and acting out deceptive and impure thoughts. Here is a rich man who is the victim of a painful disease caused by gluttony. He is willing to give large sums of money to get rid of it, but he will not sacrifice his gluttonous desires. He wants to gratify his taste for rich and unnatural desires and have his health as well. Such a man is totally unprepared to have health, because he has not yet learned the first principles of a healthy inner life. Here is an employer who adopts crooked measures to avoid paying fair wages, and, in the hope of making larger profits, reduces the wages of his workers. Such a man is altogether unfitted for prosperity, and when he finds himself bankrupt – both in reputation and riches – he blames circumstances, not knowing that he is the sole author of his condition. I have introduced these three cases merely as illustrative of the truth that man is the cause (though nearly always unconsciously) of his circumstances, and that, while aiming at a good end, he is continually frustrating its accomplishment by encouraging thoughts and desires which cannot possibly harmonize with that end. Such cases could be multiplied and varied almost indefinitely, but this is not necessary, as the reader can, if he so resolves, trace the laws of thought in his own mind and life. Circumstances, however, are so complicated; thought is so deeply rooted; and the conditions of happiness vary so much with individuals, that a man's true thoughts cannot be judged by another from the external aspect of his life. A man may be honest in certain areas, yet suffer poverty; a man may be dishonest in certain areas, yet acquire wealth. The conclusion usually formed that the one man fails because of his particular honesty, and that the other prospers because of his particular dishonesty, is the result of a superficial judgement. In the light of a deeper knowledge and wider experience, such judgment is found to be erroneous. The dishonest man may have some admirable thoughts which the other does not possess; and the honest man obnoxious thoughts which are absent in the other. It is pleasing to human vanity to believe that one suffers because of one's virtue; but not until a man has rid himself of every sickly, bitter, and impure thought can he be in a position to know that his sufferings are the result of his good, and not of his bad qualities. Yet long before he has reached that supreme perfection, he will have found the great law which is absolutely just, and which cannot, therefore, give good for evil, evil for good. Possessed of such knowledge, he will then know, looking back upon his past ignorance and blindness, that his life is, and always was, justly ordered, and that all his past experiences, good and bad, were the outworking of his evolving thoughts. Good thoughts and actions can never produce bad results; bad thoughts and actions can never produce good results. This is but saying that nothing can come from corn but corn, nothing from nettles but nettles. Men understand this law in the natural world, and work with it; but few understand it in the mental world (though its operation there is just as simple and undeviating), and they, therefore, do not cooperate with it. Suffering is always the effect of wrong thought in some direction. It is an indication that the individual is out of harmony with himself, with the law of his being. The sole and supreme use of suffering is to purify the mind, to burn out all that is useless and impure. Suffering ceases for him who is pure. There could be no object in burning gold after the dross had been removed, and a perfectly pure and enlightened being could not suffer. Poverty and greed are the two extremes of wretchedness. They are both equally unnatural and the result of mental disorder. A man is not rightly aligned until he is a happy, healthy, and prosperous being; and happiness, health, and prosperity are the result of a harmonious adjustment of the inner with the outer. A man only begins to be a man when he ceases to whine and blame, and begins to search for the hidden justice which regulates his life. And as he adapts his mind to that regulating justice, he stops blaming others as the cause of his condition, and builds himself up in strong and noble thoughts; he ceases to kick against circumstances, but begins to use circumstances as aids to his more rapid progress, and as a means of discovering the hidden powers and possibilities within himself. Law, not chaos, is the dominating principle in the universe; justice, not injustice, is the soul and substance of life. Righteousness, not corruption, is the supreme force in the spiritual government of the world. This being so, man has but to correct himself to find that the universe is right. And during the process of setting himself right, he will find that as he alters his thoughts towards things and other people, things and other people will alter towards him. The proof of this truth is in every person, and it therefore reveals itself through introspection and self-discovery. Let a man radically alter his thoughts, and he will be astonished at the rapid transformation it will effect in the material conditions of his life. Men imagine that thought can be kept secret, but it cannot. It rapidly crystallizes into habit, and habit solidifies into circumstance. Thoughts of fear, doubt, and indecision crystallize into weak and unfocused habits, which solidify into circumstances of failure, poverty, and slavish dependence. Lazy thoughts crystallize into habits of indecision and dishonesty, which solidify into circumstances of poverty. Hateful thoughts crystallize into habits of accusation and violence, which solidify into circumstances of injury and persecution. Selfish thoughts of all kinds crystallize into habits of self-seeking, which solidify into distressful circumstances. On the other hand, beautiful thoughts of all kinds crystallize into habits of grace and kindness, which solidify into sunny circumstances. Pure thoughts crystallize into habits of modesty and self-control, which solidify into circumstances of repose and peace. Thoughts of courage and firm decision crystallize into positive habits, which solidify into circumstances of success, plenty, and freedom. Energetic thoughts crystallize into habits of industry, which solidify into circumstances of pleasantness. Gentle and forgiving thoughts crystallize into habits of gentleness, which solidify into protective circumstances. Loving and unselfish thoughts solidify into circumstances of abiding prosperity and true riches. A particular train of thought persisted in, be it good or bad, cannot fail to produce results. A man cannot directly choose his circumstances, but he can choose his thoughts, and so indirectly, yet surely, shape his circumstances. Let a man cease from his harsh thoughts, and all the world will soften towards him, and be ready to help him. Let him put away his weakly and sickly thoughts, and the opportunities will spring up on every hand to aid his strong decision. Let him encourage good thoughts, and no hard fate shall bind him down to wretchedness and shame. The world is your kaleidoscope, and the varying combinations of colors which at every succeeding moment it presents to you are the exquisitely adjusted pictures of your ever-moving thoughts. The body is the servant of the mind. It obeys the operations of the mind, whether they be deliberately chosen or unconsciously expressed. At the bidding of unlawful thoughts the body sinks rapidly into disease and decay; at the command of glad and beautiful thoughts it becomes clothed with youthfulness and beauty. Disease and health, like circumstances, are rooted in thought. Sickly thoughts will express themselves through a sickly body. Thoughts of fear have been known to kill a man as speedily as a bullet and they are continually killing thousands of people just as surely though less rapidly. The people who live in fear of disease are the people who get it. Anxiety quickly demoralizes the whole body, and lays it open to the entrance of disease; while impure thoughts, even if not acted out, will sooner shatter the nervous system. Men will continue to have impure and poisoned blood, so long as they propagate unclean thoughts. Out of a clean heart comes a clean life and a clean body. Out of a defiled mind proceeds a defiled life and a corrupt body. Thought is the fountain of action, life and manifestation; make the fountain pure, and all will be pure. There is no physician like cheerful thought for dissipating the ills of the body; there is no comforter to compare with goodwill for dispersing the shadows of grief and sorrow. To live continually in thoughts of cynicism, suspicion, and envy, is to be confined in a self-made prison. But to think well of all, to be cheerful with all, to patiently learn to find the good in all – such unselfish thoughts are the very portals of heaven; and to dwell day by day in thoughts of peace toward every creature will bring abounding peace to their possessor. Until thought is linked with purpose there is no intelligent accomplishment. With the majority the raft of thought is allowed to drift upon the ocean of life. Aimlessness is a vice, and such drifting must not continue for him who would steer clear of catastrophe and destruction. They who have no central purpose in their life fall an easy prey to petty worries, fears, troubles, and insecurity, all of which lead to failure, unhappiness, and loss. Weakness cannot persist in a power-evolving universe. A man should conceive of a legitimate purpose in his heart, and set out to accomplish it. He should make this purpose the centralizing point of his thoughts. It may take the form of a spiritual ideal, or it may be a worldly object, according to his nature at the time. Whichever it is, he should steadily focus his thought-forces upon the object he had set before him. He should make this purpose his supreme duty and should devote himself to its attainment, not allowing his thoughts to wander away into ephemeral fancies, longings, and imaginings. This is the royal road to self-control and true concentration of thought. Even if he fails again and again to accomplish his purpose – as he must until weakness is overcome – the strength of character gained will be the measure of his true success, and this will form a new starting point for future power and triumph. Those who are not prepared for the consideration of a great purpose should fix their thoughts upon the faultless performance of their duty, no matter how insignificant the tasks may appear. Only in this way can thoughts be gathered and focused, and resolution and energy be developed. Once this is done, there is nothing which may not be accomplished. The weakest soul, knowing its own weakness, and believing that strength can only be developed by effort and practice, will at once begin to exert itself. And, adding effort to effort, patience to patience, and strength to strength, it will never cease to develop and will at last grow divinely strong. As the physically weak man can make himself strong by careful and patient training, so the man of weak thoughts can make the mind strong by exercising himself in right thinking. To put away aimlessness and weakness and to begin to think with purpose is to enter the ranks of those strong ones who only recognize failure as one of the pathways to success. These ones make all conditions serve them, and think strongly, attempt fearlessly, and accomplish masterfully. Having conceived of his purpose, a man should mentally mark out a straight pathway to its achievement, looking neither to the right nor left. Doubts and fears should be rigorously excluded. They are distracting elements which break up the straight line of effort, rendering it crooked, ineffectual, and useless. Thoughts of doubt and fear can never accomplish anything; they always lead to failure. Purpose, energy, power, and all strong thoughts cease when doubt and fear creep in. Thought allied fearlessly with purpose becomes a creative force. He who knows this is ready to become something higher and stronger than a bundle of wavering thoughts and fluctuating sensations. He who does this has become the conscious and intelligent wielder of his mental powers. The dreamers are the saviors of the world. As the visible world is sustained by the invisible, so men, throughout all their trials and troubles, are nourished by the beautiful visions of their dreamers. Humanity cannot forget its dreamers; it cannot let their ideals fade and die. It lives in them; it knows them as the realities which it shall one day see and know. Composer, sculptor, painter, poet, prophet, sage – these are the makers of the after-world, the architects of heaven. The world is beautiful because they have lived. Without them, laboring humanity would perish. Cherish your visions; cherish your ideals. Cherish the music that stirs in your heart, the beauty that forms in your mind, the loveliness that drapes your purest thoughts. For out of these will grow all delightful conditions, all heavenly environment; of these, if you but remain true to them, your world will at last be built. To desire is to obtain; to aspire is to achieve. Shall man's lowest desires receive the fullest gratification, and his purest aspirations starve for lack of sustenance? Such is not the Law. Such a condition can never obtain: "Ask and receive." The greatest achievement was at first a dream. The oak sleeps in the acorn; the bird waits in the egg. And in the highest vision of a soul, a waking angel stirs. Dreams are the seedlings of realities. Your circumstances may be unhappy, but they shall not remain so if you only perceive an ideal and strive to reach it. You can't travel within and stand still without. Here is a youth hard pressed by poverty and labor. Confined long hours in an unhealthy workshop; unschooled and lacking all the arts of refinement. But he dreams of better things. He thinks of intelligence, or refinement, of grace and beauty. He conceives of, mentally builds up, an ideal condition of life. The wider liberty and a larger scope takes possession of him; unrest urges him to action, and he uses all his spare times and means to the development of his inner powers and resources. Very soon his mind has become so altered that the workshop can no longer hold him. It has become so out of harmony with his mind-set that it falls out of his life as a garment is cast aside. And with the growth of opportunities that fit the scope of his expanding powers, he passes out of it altogether. Years later we see this youth as a grown man. We find him a master of certain forces of the mind that he wields with brilliant influence and power. In his hands he holds the cords of gigantic responsibilities; he speaks and lives are changed. Sun-like, he becomes an inspiring and luminous center around which actions revolve. He has become the vision of his youth. He has become one with his ideal. And you too, youthful reader, will realize the vision (not just the idle wish) of your heart, be it base or beautiful, or a mixture of both, for you will always gravitate toward that which you, secretly, most love. Into your hands will be placed the exact results of your own thoughts. You will receive that which you earn; no more, no less. Whatever your present environment may be, you will fall, remain, or rise with your thoughts – your vision, your ideal. You will become as small as your controlling desire; as great as your dominant aspiration. In the beautiful words of Stanton Kirkham Davis, "You may be keeping accounts, and presently you shall walk out of the door that for so long has seemed to you the barrier of your ideals, and shall find yourself before an audience – the pen still behind your ear, the ink stains on your fingers – and then and there shall pour out the torrent of your inspiration. You may be driving sheep, and you shall wander to the city – bucolic and open mouthed; shall wander under the intrepid guidance of the spirit into the studio of the master, and after a time he shall say, 'I have nothing more to teach you.' And now you have become the master, you who did so recently dream of great things while driving sheep. You shall lay down the saw and the plane to take upon yourself the regeneration of the world." The thoughtless, the ignorant, and the indolent, seeing only the apparent effects of things and not the things themselves, talk of luck, of fortune, and chance. Seeing a man grow rich, they say, "How lucky he is!" Observing another become skilled intellectually, they exclaim, "How highly favored he is!" And noting the saintly character and wide influence of another, they remark, "How chance helps him at every turn!" They do not see the trials and failures and struggles which these men have voluntarily encountered in order to gain their experience; have no knowledge of the sacrifices they have made, of the undaunted efforts they have put forth, of the faith they have exercised so that they might overcome the apparently insurmountable and realize the vision of their heart. They do not know the darkness and the heartaches; they only see the light and joy, and call it "luck"; do not see the long, arduous journey, but only behold the pleasant goal and call it "good fortune"; do not understand the process, but only perceive the result, and call it "chance"
In all human affairs there are efforts, and there are results. The strength of the effort is the measure of the result. Gifts, powers, material, intellectual, and spiritual possessions are the fruits of effort. They are thoughts completed, objectives accomplished, visions realized. The vision that you glorify in your mind, the ideal that you enthrone in your heart – this you will build your life by; this you will become. "As the plant springs from the seed, and could not be without it, so every act of man springs from the hidden seeds of thought, and could not have appeared without them."